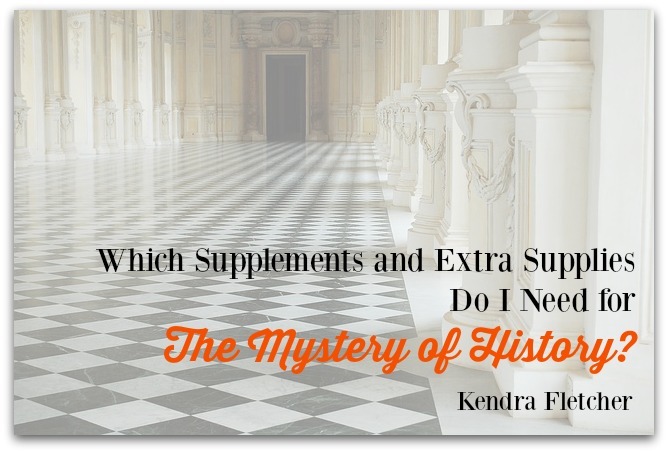 Which Supplements and Extra Supplies Do I Need for The Mystery of History? I'm often asked which supplements are truly needed when a family decides to use The Mystery of History for their homeschool history curriculum. There are some wonderful things available, but how do you choose what is right for your family? What is necessary? If you choose the audio or eBook versions of volumes I or II, you will need to purchase the companion guide. It includes projects, maps, quizzes and tests that are included in the softback versions. Note: You must purchase the Volume III Companion Guide separately from the text because the text is a beautiful hardbound edition that contains gorgeous pictures of Renaissance masterpieces and other artwork. There wasn't room to add the companion guide to that book! Note: The Companion Guide for Volume IV is included on a disc with the book. If you are looking to just have the printable items (maps, crafts, quizzes, and tests) on a disc, then you will want the Reproducibles CD. It's not necessary if you purchase the Companion Guide or the softback text. All reproducibles for Volume IV are included on a disc that accompanies the text. Now that you have the text, what supplements should you add? You'll need to consider your students. What are their interests? What are their grade levels and ages? Do they like to color, or will they scoff at coloring pages? Do they like hands-on projects, or would they prefer to keep detailed notebooks? The coloring pages for The Mystery of History are well done. They correlate to each chapter so that all you have to do is print, punch holes, and arrange them in a binder in order. Unless you have a student who is raring to write, I'd recommend sticking with the coloring pages until at least 2nd grade. They can write a simple sentence as a caption if you feel they need some note-taking practice. Most 3rd graders can handle simple note-taking, but be realistic in your expectations. One or two sentences will suffice, and you might need to write those sentences on a white board for them to copy. They'll soon get the hang of what facts should be written down. I like the notebooking pages for The Mystery of History because not only are they attractive, they prompt the student appropriately so there's no guesswork as to what they should be writing. What about note-taking for high schoolers? Good old fashioned college rule lined paper and a short lesson on how to outline. Folderbooks are also a great option because not only does the student get to create a valuable teaching tool, they have something to show to friends and relatives. Every time they show their folderbook, they're reviewing the material, and I call that a teaching win! However, speaking from personal experience I'll tell you that one of my sons just couldn't handle having to cut things out. Folderbooks were not for him, so while his siblings enjoy folderbooks, they were a no-go for that boy. You'll want to consider whether or not you have a folderbook-type of kid. The above folderbook is an example but is not from the The Mystery of History collection. If you have students who love projects, crafts, and art, you'll want to pick up the Enrichment 4 You Craft Pack. These are lovely projects that older kids will enjoy, and they come with adequate information so you'll get a mini lesson, as well. Chinese paper cuts, fossilized ferns, ancient oil lamps, and more. Amy Pak's beautiful timeline figures are great for all ages. They can be colored with crayons or colored pencils and laid out in binders or all along a wall, if you like. OR, get them all together on one CD! Challenge Cards - Each lesson has three questions that give the highlights of “who, what, where, when, and how.” These questions, when memorized over the course of a school year, give a framework and chronology of history that will eventually work into their long-term memory. It is highly recommended that you review them regularly as you move through the study of history. Included with the cards are game ideas and other suggestions for usage. If you want to major on memory work, the cards will make it a grab-and-go endeavor. What if I Want it All? Yes! You can also use the Volume II Cookbook, which is full of historical recipes from the Middle Ages, notes about the foods and customs, printable recipe cards, and geographical notes. If my kids get to do something food-related to the period we're studying, they remember it! 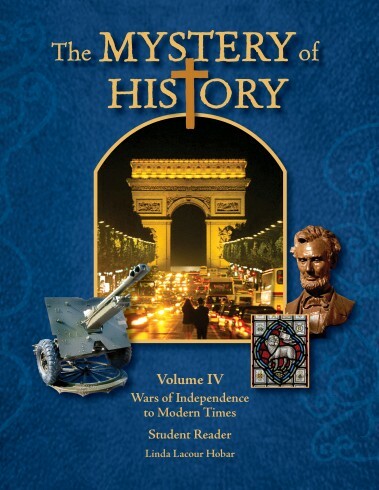 The Mystery of History is Now Available on Kindle! Sign up and get your own copy of 10 Ways to Delight In Your Preschooler, absolutely free!